Men’s gloves have been around for centuries. They started as protection for the hands, or for doing tough jobs outside the house. Today, they are so much more. There is one pair for every situation. Whether you find yourself going to work in a freezing morning and need to warm up your hands, or just want to look cool while driving, be sure there is a suitable pair for you. Nowadays, gloves are a man’s wardrobe essential. An accessory that not only is practical, but elevates your outer appearance too. Men’s gloves complete every winter outfit perfectly, making you look fashionable and a real gentleman without any additional effort from you. So if you are in search for the perfect pair of leather gloves for men, there are some key characteristics that you should look out for, before you make your purchase. You want your gloves to last, right? Then you shouldn’t compromise on quality; a good pair of men’s leather gloves, will be made out of exceptional soft leather, that ensures your gloves are timeless. Another really important detail you should consider, is the craftsmanship. Strong stitches and sturdy lining, are things you find only in high quality gloves. Last but not least, pick a classic color like black or brown; they’re always in fashion. Be sure to check out GSG online, to find your perfect pair. Two amazing styles of leather gloves for men, are the “GSG Windproof Touch Screen Leather Gloves” and the “GSG Brown Warm Leather Gloves”. The first pair, is your classic black pair of gloves but with a twist. 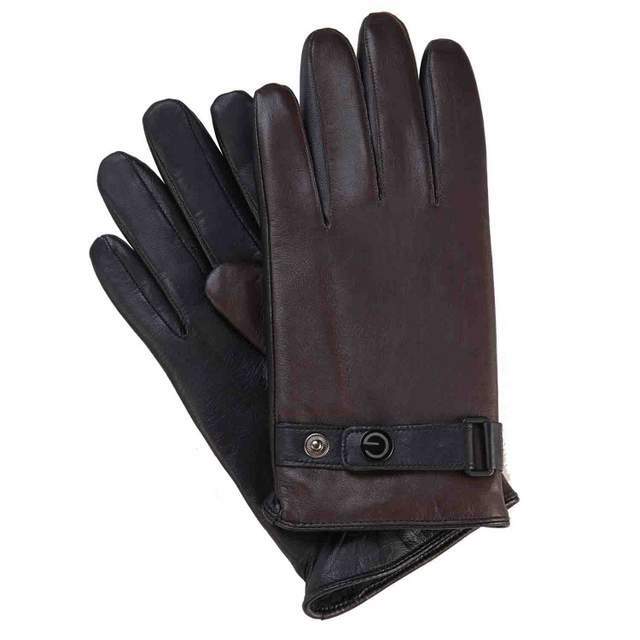 It is made from timeless sheep skin leather, and features beautiful stitching detail to give it character, and elastic cuff for extra protection from the cold. The best part? You can use all your tech devices without taking them off due to the special material on the thumb. The second pair, is the ultimate fashion item to have in your collection. A color contrasting piece made from luxurious goat leather, manages to keep you warm when the temperature falls, due to the elastic cuff and metal snap button. Brown on the back of the hand and black in the palm, ensures that you’ll stand out for sure. Choose what suits you best and get ready for a cozy winter!